Additional Info: India offers great opportunities for wildlife tourism. The vast amount of wildlife in India comprises of more than 70 national parks and about 400 wildlife sanctuaries including the bird sanctuaries. India has the most diverse varieties of beaches anywhere in the world. The mountain ranges in India are breathtaking and provide exciting, beautiful trekking routes. With the vast visual display of the Himalayas and Karakoram (mountain range spanning the borders between Pakistan, China, and India), there are thousands of possible trekking routes. Popular for the adventure tourist is the Garhwal region. Some trekking options are detailed below. Garhwal is often described as the most beautiful region in the Himalayas.. Towering snow peaks, flower carpeted meadows, iconic temples, wildlife. The combination of these factors makes it irresistible. Chandrashila Trek is one of the popular treks and can be undertaken round the year except during heavy snowing months of winter (Dec-Jan). Chandrashila summit is a rock face above the temple of Tungnath, the highest of all the temples in the Himalayas. It is a short but rigorous hike beyond the temple. The Chandrashila summit offers the most beautiful view of the Nandadevi, Trishul, Kedar Peak and Chaukhamba peaks. Begin the trek in Rishikesh, at the foothills of Garhwal hills. If you go high into the mountains, you can find the mysterious and beautiful Dodital lake. The serene, tranquil surroundings, gurgling streams, crystal clear water, and dense alpine forests make for an ideal retreat. The trek from Dodital to Yamnotri takes you through high altitude grasslands and dense virgin forests. This trek starts at Uttarkashi or Kalyani.. Kalyani to Agoda is a gradual climb through woods, fields and villages along a mule track. The trek from Agoda to Dodi Tal is steep and through thick forests. Dodital is a high altitude lake at a height of 10,850 ft. Situated among pine forests with the backdrop of a high altitude meadow; Dodital has a calming effect on the mind and body. Dodital gets its name from Dodi, the local name for trout, which are found in large numbers in the lake. 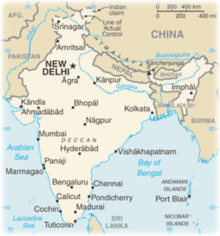 The Himalayas are a mountain range separating the Indian subcontinent from the Tibetan Plateau. By extension, it is also the name of the massive mountain system which includes the Himalaya proper, the Karakoram, the Hindu Kush, and a host of minor ranges extending from the Pamir Knot. The name means "the abode of snow" (from hima "snow", and alaya "abode"). Together, the Himalaya mountain system is the planet's highest and home to the world's highest peaks: the Eight-thousanders, including Mount_Everest. Ideal time for mountain climbing in India is from May to October. The Indian Mountaineering Foundation helps in organizing and sponsoring mountaineering expeditions. It is recommended to give at least a 6 month's notice before setting out on an expedition. The extreme Northern part of India holds immense mountaineering charm in the region of Jammu and Kashmir with some of its most beautiful snow capped peaks, whereas Ladakh captures the attraction of some of the high altitude peaks with their scenic beauty. Mountaineering these regions will provide you with such dramatic scenery as its lush green alpine vales; flower-strewn meadows; meandering tributaries and river streams and glacier-topped mountains. Ladakh ("land of high passes") is a province in the Indian state of Jammu and Kashmir sandwiched between the Kun lun mountain range in the north and the main Great Himalayas to the south, inhabited by people of Indo-Aryan and Tibetan descent. It is one of the most sparsely populated regions in Kashmir. 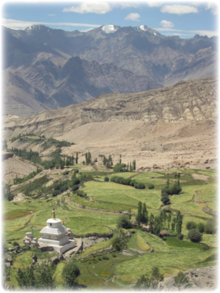 Ladakh is renowned for its remote mountain beauty and Buddhist culture. It is sometimes called "Little Tibet" as it has been strongly influenced by Tibetan culture. Ladakh is a mountaineer's delight due to its several mountain ranges like Karakoram, Zangskar and Ladakh Ranges. The most famous and easily accessible is the Stok Khangri massif in Zangskar range, south of Leh. The base Camp for various peaks of this massif is about four days trek from the village of Stok or Spituk. Among its known peaks Stok Khangri (6,150m or 20,177ft) is the most famous between tourist and localities as a trekking peak. It offers a spectacular view of Indus valley and Karakoram Range. Other peaks in this area include Golaib Khangri (5,900m or 19,357ft), adjacent to Stok is Matho west (5,950m or 19,520ft) and many unnamed peaks in the same range. Bodh Gaya - As the site of the Buddha Shakyamuni's enlightenment, Bodh Gaya is the most revered of all Buddhist sacred sites. The main complex houses the famous Mahabodhi temple/stupa and a descendant of the original Bodhi Tree under which the Buddha gained enlightenment. 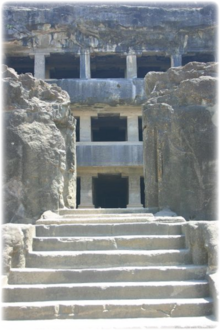 The Ajanta and Ellora Caves - despite the name, Ajanta and Ellora are not a series of caves, but temples built out from cavities carved by Buddhist monks in 200BCE. They had fallen into a state of disrepair, but were restored after being discovered in 1819 by the British military. Altogether, there are 30 caves. The works of art displayed in these caves are some of the best examples of Buddhist iconology in India. 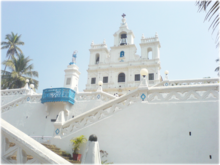 Goa is world famous for its beaches, its ancient temples and churches, and its Goan carnival. The most popular celebrations in Goa are Christmas, Easter Sunday, Ganesh Chaturthi, Divali, New Year's Day, Shigmo and the Carnival. However, since the 1960s, the celebrations of the Shigmo and carnival have shifted to the urban centers, and in recent times these festivals are seen more as a means of attracting tourists. Celebrations for all festivals usually last for a few days and include parties and balls. 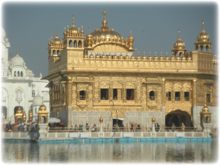 The Golden Temple is the most sacred and holiest shrine of Sikhism (the holy-of-holies of Sikhism). It is located in Amritsar (meaning: Pool of the Nectar of Immortality), the holiest city in Sikhism, in the state of Punjab, India. Sikh devotees, for whom the Temple is a symbol of infinite freedom and spiritual independence, come to the Temple from all over the world to enjoy its environs and offer their prayers. Hampi is a village in northern Karnataka, on the banks of the Tungabhadra River in India. Hampi is located within the ruins of Vijayanagara, the former capital of the Vijayanagara Empire. Possibly predating the city of Vijayanagara, this village continues to be an important religious center, housing the Virupaksha Temple. 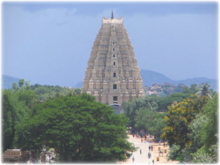 The village of Hampi contains several other monuments belonging to the old city. It extends into some of the old ceremonial streets of Vijayanagara. As the village is at the original center of Vijayanagara, it is sometimes confused with this ruined city. Hampi is also called "The City of Ruins". The Vijayanagara ruins are listed as the Group of Monuments at Hampi as a UNESCO World Heritage Site. Hampi is worth a visit. The area is simply stunning and you will be in awe of the millions of boulders surrounding the area. However, within this arid landscape lies a little oasis with lush palm, banana and mango trees nestled near the river. Hampi is a great place to spend a few days wandering around and discovering the rich, vibrant history. The Taj Mahal is a mausoleum located in Agra, India, that was built under Mughal Emperor Shah Jahan in memory of his favorite wife, Mumtaz Mahal. The Taj Mahal is considered the finest example of Mughal architecture, a style that combines elements from Persian, Turkish, Indian, and Islamic architectural styles. In 1983, Taj Mahal became a UNESCO World Heritage Site and was cited as "the jewel of Muslim art in India and one of the universally admired masterpieces of the world's heritage." While the white domed marble mausoleum is most familiar, Taj Mahal is an integrated complex of structures and was completed around 1648. The best time to visit the city is from Mid January to April and from September to Mid December. 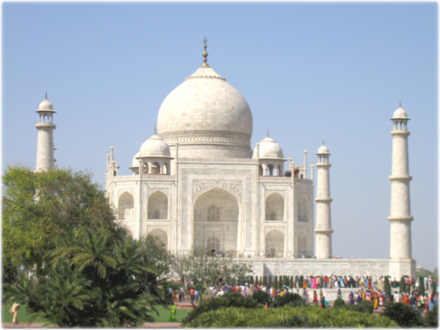 Agra is 125 miles from New Delhi and is one of the points of the tourist's Golden Triangle of Agra-Delhi-Jaipur. Agra is also very well connected via rail and road with other nearby cities and tourist destinations.